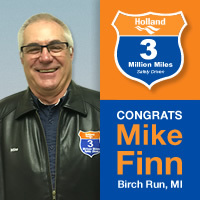 Finn has been driving professionally for 36 years–the past 30 of which he’s spent with Holland. He operates as a linehaul driver out of the Holland Birch Run, MI service center, and makes the 450-mile roundtrip to South Bend, IN and back 5 days per week. His route takes him through one of the country’s most challenging snowbelts, making his record even more impressive.